Thousands of government opponents marched through the capital on Sunday to protest President Hugo Chavez's decision to pull the plug on an opposition-aligned TV station. Demonstrators made their way to the offices of the People's Defender, a government official in charge of monitoring human rights, and presented a document saying that Chavez is restricting freedom of expression by not renewing Radio Caracas Television's broadcast license. "We are marching for a free country," said preschool teacher Cecilia de Becerra, as hundreds of police in riot gear stood outside the government building. "We have faith that things can change." Hundreds of other protesters gathered outside the studios of Venevision to condemn the privately owned television channel for recently curbing its criticism of the government. Radio Caracas Television, or RCTV, was forced off the air May 27 after Chavez refused to renew its license, citing the channel's conduct during a failed coup in 2002 and alleged violations of broadcast laws. RCTV's executives deny any wrongdoing. They accuse Chavez, who threatened on Saturday to yank the broadcast licenses of other private media outlets he accuses of sowing unrest, of trying to muzzle his most outspoken critics. 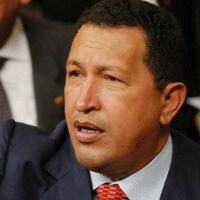 Chavez's decision has been condemned by foreign governments, press freedom groups and international human rights organizations. Although many of Venezuela's media outlets are still privately owned and critical of Chavez, the RCTV case has raised concerns because it was the only opposition-sided TV station with nationwide reach.